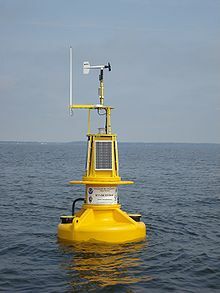 ◆ A buoy can be anchored or allowed to drift. ◆ The life jacket buoyed her up until help arrived. ◆ a glider buoyed by air currents. ◆ buoyed up by the team spirit and the pride of the older generation back at home. ეს გვერდი ბოლოს დარედაქტირდა: 18:22, 2 მაისი 2017.